DHAKA—Two years ago in Bangladesh the collapse of Rana Plaza killed more than 1,100 garment factory workers in the world’s deadliest garment industry disaster. Efforts are underway to make thousands of garment factories safer in the world’s second-largest maker of clothes, with varying degrees of success. Garment workers put the finishing touches on shirts with slogans such as “Never Tired”, “Holly Whyte” and “True Love Forever – New York City.” The factory is in Savar, on the outskirts of Dhaka, far from the customers who will buy these shirts. Alif Embroidery Village, a factory with about 1,800 garment workers, makes clothes for international brands such as H&M, Gap and Zara. Engineers and contractors are also at work in the factory installing new fire doors, hydrant pumps, high-tech fire alarms and other equipment. Construction workers climb into a hole around a pillar on the ground floor. Mark Chubb is the chief safety officer of the Alliance for Bangladesh Worker Safety that represents 26 of the biggest U.S. clothing buyers, including retail giants Walmart, Target and Gap. “They are expanding the reinforcing bar around the column and then will add concrete around that to increase compressive strength,” said Chubb. Two years ago, on April 24, Rana Plaza collapsed, killing more than 1,100 garment workers and injuring 2,500. It focused a spotlight on unsafe working conditions in Bangladesh’s garment industry, the second-largest in the world after China. 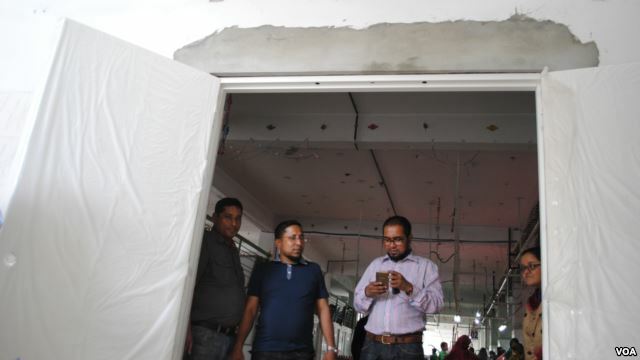 Sweeping efforts are underway to fix electrical, structural and fire safety problems to make all 3,500 of Bangladesh’s export garment factories compliant with international safety standards. The garment industry accounts for 80 percent of the country’s exports and employs more than four million workers. Eighty percent of them are women. More than 200 clothing brands have pledged to make their source factories safer under two international agreements called the Bangladesh Accord on Fire and Building Safety and the non-binding Alliance for Bangladesh Worker Safety. If factories do not comply, Accord and Alliance members cannot buy merchandise from them. There are approximately 1,400 factories not covered by the Accord and Alliance that fall under a third initiative, the government and ILO-backed National Tripartite Plan. Chief safety inspector of the Accord Brad Loewen estimates the top third of Accord factories are progressing well with remediation. But he says the middle-third are grudging and slower and the bottom third “are fighting” or do not understand the work. Upgrades at Alif Embroidery Village will cost $1.5 million even though it already had fire safety equipment many factories do not have. But the chairman and managing director of Alif, Mohammad Akter Rana, is optimistic. “It is a big financial burden, but I treat it as an investment that can bring something better for my business and my people,” said Rana. One fire door costs about $1,200, while a hydrant pump can cost $60,000. Smaller factories are struggling to finance fixes and need low-interest loans, said the vice president of finance of the Bangladesh Garment Manufacturers Export Association, Reaz Bin Mahmood. The government has recruited more than 200 new labor inspectors and labor laws are being finalized. Garment workers are also joining new unions. There are about 200 active unions, up from seven in 2010. And there is heated debate about forming new worker safety committees in factories. “There is not a culture of workers having a say in factories. It is not going to be easy to establish that,” said Loewen of the Accord. But the ILO and others say engaging workers is key to making safety sustainable in Bangladesh’s garment factories.